From the issue dated Apr 18th, 1943. GEORGETOWN, BRITISH GUIANA— The U. S. Army does a lot of strange things, but we'll bet you didn't know it was running a Navy in South America. 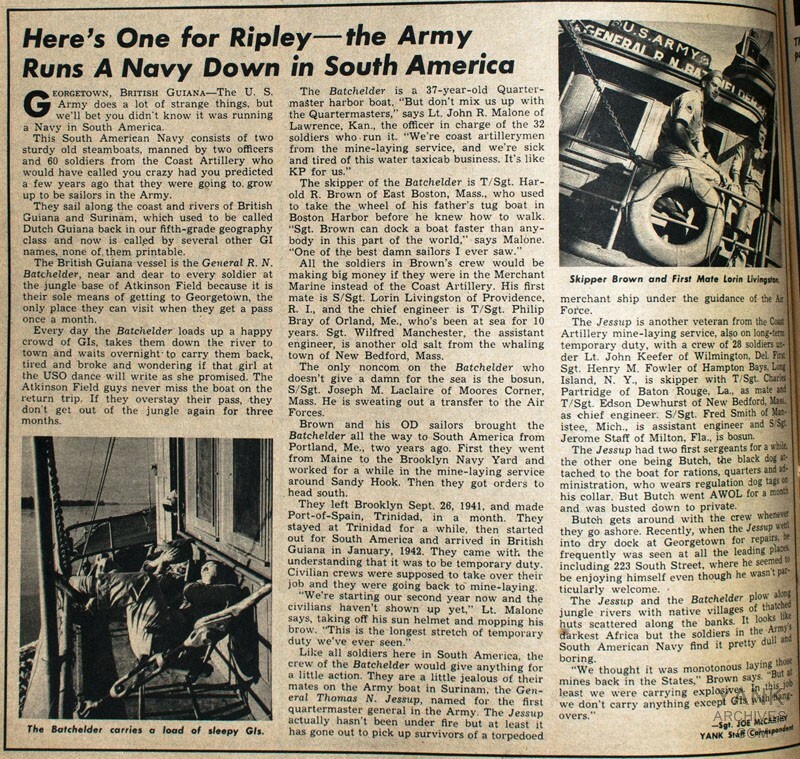 This South American Navy consists of two sturdy old steam­boats, manned by two officers and 60 soldiers from the Coast Artillery who would have called you crazy had you predicted a few years ago that they were going to grow up to be sailors in the Army. They sail along the coast and rivers of British Guiana and Surinam, which used to be called Dutch Guiana back in our fifth-grade geography class and now is called by several other GI names, none of them printable. 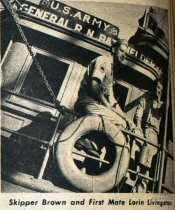 The British Guiana vessel is the General R. N. Batchelder, near and dear to every soldier at the jungle base of Atkinson Field because it is their sole means of getting to Georgetown, the only place they can visit when they get a pass once a month. Every day the Batchelder loads up a happy crowd of GIs, takes them down the river to town and waits overnight to carry them back, tired and broke and wondering if that girl at the USO dance will write as she promised. The Atkinson Field guys never miss the boat on the return trip. If they overstay their pass, they don't get out of the jungle again for three months. The Batchelder is a 37-year-old Quartermaster harbor boat. "But don't mix us up with the Quartermasters," says Lt. John R. Malone of Lawrence, Kan., the officer in charge of the 32 soldiers who run it. "We're coast artillerymen from the mine-laying service, and we're sick and tired of this water taxicab business. It's like KP for us." The skipper of the Batchelder is T/Sgt. Harold R. Brown of East Boston, Mass., who used to take the wheel of his father's tug boat in Boston Harbor before he knew how to walk. "Sgt. Brown can dock a boat faster than anybody in this part of the world," says Malone. "One of the best damn sailors I ever saw." All the soldiers in Brown's crew would be making big money if they were in the Merchant Marine instead of the Coast Artillery. His first mate is S/Sgt. Lorin Livingston of Providence, R.I., and the chief engineer is T/Sgt. Philip Bray of Orland, Me., who's been at sea for 10 years. Sgt. Wilfred Manchester, the assistant engineer, is another old salt from the whaling town of New Bedford, Mass. The only noncom on the Batchelder who doesn't give a damn for the sea is the bosun, S/Sgt. Joseph M. Laclaire of Moores Corner, Mass. He is sweating out a transfer to the Air Forces. Brown and his OD sailors brought the Batchelder all the way to South America from Portland, Me., two years ago. First they went from Maine to the Brooklyn Navy Yard and worked for a while in the mine-laying service around Sandy Hook. Then they got orders to head south. They left Brooklyn Sept. 26, 1941, and made Port-of-Spain, Trinidad, in a month. 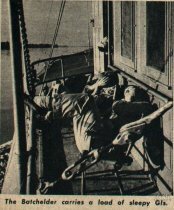 They stayed at Trinidad for a while, then started out for South America and arrived in British Guiana in January, 1942. They came with the understanding that it was to be temporary duty. Civilian crews were supposed to take over their job and they were going back to mine-laying. "We're starting our second year now and the civilians haven't shown up yet," Lt. Malone says, taking off his sun helmet and mopping his brow. "This is the longest stretch of temporary duty we've ever seen." Like all soldiers here in South America, the crew of the Batchelder would give anything for a little action. They are a little jealous of their mates on the Army boat in Surinam, the General Thomas N. Jessup, named for the first quarter­master general in the Army. The Jessup actually hasn't been under fire but at least it has gone out to pick up survivors of a torpedoed merchant ship under the guidance of the Air Force. The Jessup is another veteran from the Coast Artillery mine-laying service, also on long-term temporary duty, with a crew of 28 soldiers under Lt. John Keefer of Wilmington, Del. First Sgt. Henry M. Fowler of Hampton Bays, Long Island, N.Y., is skipper with T/Sgt. Charles Partridge of Baton Rouge, La., as mate and T/Sgt. Edson Dewhurst of New Bedford, Mass. as chief engineer. S/Sgt. Fred Smith of Manistee, Mich., is assistant engineer and S/Sgt. Jerome Staff of Milton, Fla., is bosun. The Jessup had two first sergeants for a while, the other one being Butch, the black dog attached to the boat for rations, quarters and ad­ministration, who wears regulation dog tags on his collar. But Butch went AWOL for a month and was busted down to private. Butch gets around with the crew whenever they go ashore. Recently, when the Jessup went into dry dock at Georgetown for repairs, he frequently was seen at all the leading places, including 223 South Street, where he seemed to be enjoying himself even though he wasn't particularly welcome. The Jessup and the Batchelder plow along jungle rivers with native villages of thatched huts scattered along the banks. It looks like darkest Africa but the soldiers in the Army's South American Navy find it pretty dull and boring. "We thought it was monotonous laying those mines back in the States," Brown says. "But at least we were carrying explosives. In this job we don't carry anything except GIs with hangovers."